It’s been half term and after thinking that we had all managed to get through the winter months with no illnesses, Little Z and Big A both come down with a bug, which is then passed on to my fit and healthy mother. I’m just waiting to be knocked for six myself but am trying not to dwell on the possibility. So instead of being out and about this week we have been hibernating inside and keeping cosy. With everyone on the mend and appetites returned I made a batch of these delicious morsels to cheer up my loved ones. They were gone in a blink of an eye, so I felt that I must share this simple recipe with you. Baked sweet potatoes are a delicious addition to any dish, whether it be accompanying, fish, meat or other vegetables. They are also great as pre dinner nibbles if you have guests coming over or if you just simply fancy spoiling yourself or your family. With very little effort you can create these baked paprika chips with a creme fraiche dip and I assure you they are totally addictive. I am a huge fan of Santo Domingo Hot Spanish Smoked Paprika which you can buy here, as it has a real kick. As the girls adore them, I bake a batch without paprika or the less hot variety, so they can devour them as well. 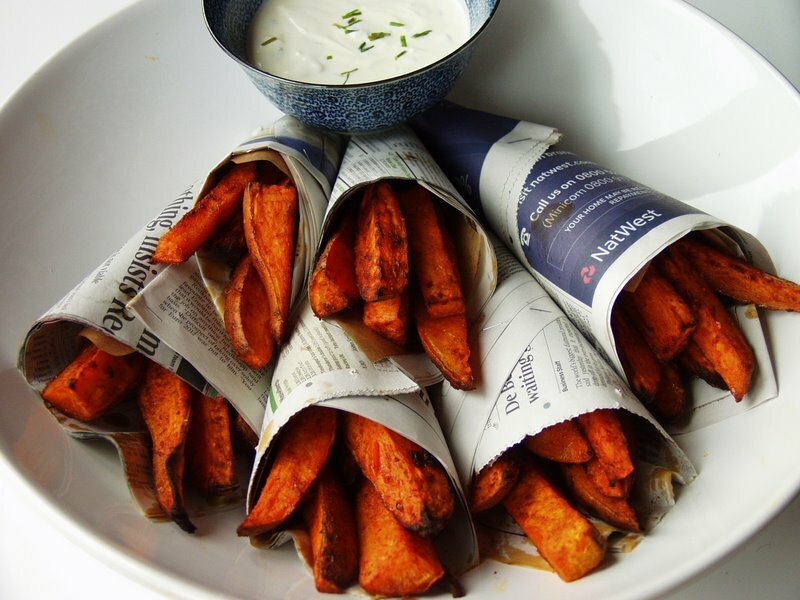 As an alternative way to serve them as nibbles, I make little paper cones and line each cone with baking parchment, so that the chips do not get stained with newspaper ink. The velvety creme fraiche is a great accompaniment and I like to add chives, as Big A is a big fan, a good splash of lemon juice and a sprinkling of rock salt. Simple and delicious. 1. Wash the sweet potatoes, but do not bother to peal them as the skins taste great when cooked. Chop them into chip/wedge size chunks and place in a large mixing bowl. Add the olive oil, rock salt and hot paprika and mix thoroughly with your hands so that all the pieces are completely covered. 2. In a preheated oven – 180 degree fan oven – place the sweet potatoes on baking/greaseproof paper on top of a baking tray and bake for 30-40 minutes or until they are soft. 3. When the sweet potatoes are baking prepare the dip by mixing all the ingredients together and taste and add more seasoning if necessary. 4. Serve immediately with the dip on the side. This entry was posted in Snacks, Vegetable, Vegetarian and tagged chives, cream, creme fraiche, lemon, olive oil, paprika, rock salt, sweet potatoes. Bookmark the permalink. 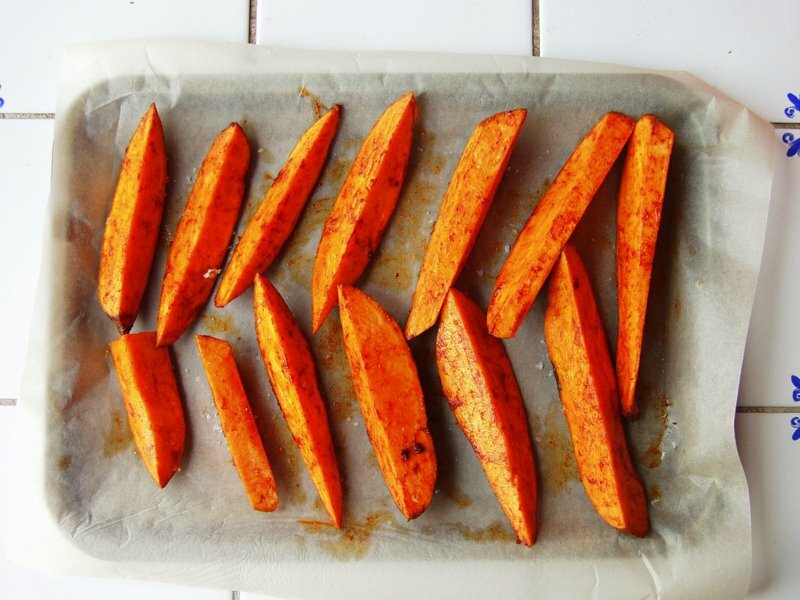 Very pretty pictures of sweet potato fries. Love the dipping sauce. That’s sweet of you to say Connie. Welcome to my blog. These look AMAZING! I adore roasted sweet potato but I’ve never thought of making chips like these. My kids are going to love them – thanks for the inspiration! My two little girls (6 and 2) love them, I just go light on the paprika as the one I use has a real kick to it. Hope they/ you like them. Looks delicious. I am a huge fan of sweet potato fries but I have never made them with paprika. Looking forward to trying it.